Claustrophobia : The fear of enclosed spaces. Having studied phobias when training in hypnotherapy a few years ago, I developed an interested in the topic of phobic reactions and the underlying mental processes which allow a principally non-threatening event to become mentally and in extreme cases, physically overwhelming to the sufferer. I don’t consider my dislike of airless, enclosed spaces to be a genuine phobia. My distaste of such environments is a rationally driven concern that I will usually become uncomfortable in places such as in sweaty overcrowded lifts, rush-hour deep-line tubes or the horrendously overcrowded Mumbai suburban train network. I can deal with the situation, but prefer to avoid it in the first place. A coping strategy if you will. Other people when faced with claustrophobia will become consumed with panic. The very ides of descending into an underground space for example, would send shivers through them. 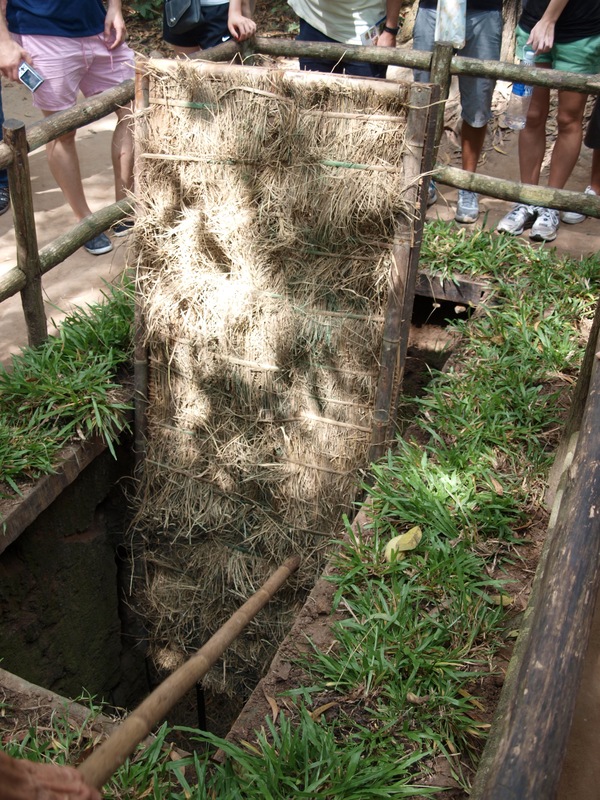 Good thing then there were no claustrophobics on our tour of the Cu Chi tunnels, one of the most infamous battlegrounds of the Vietnam War. The tunnels are small, dark and long, but I’ll come to that later. First up some more first-rate propaganda from the Vietnamese Government, this time in the form of a black & white VT played to the assembled Brits, Aussies, Swedes and Italians, each of whom was too young to remember the war. The scratched film with a crackling soundtrack shows pitiless B-52 bombers raining down their deadly load upon defenceless villages. In a magnificent display of ham-acting, villagers run for cover whilst glorious Viet Cong guerrillas fight back against the evil yank foe. In that respect she was right. 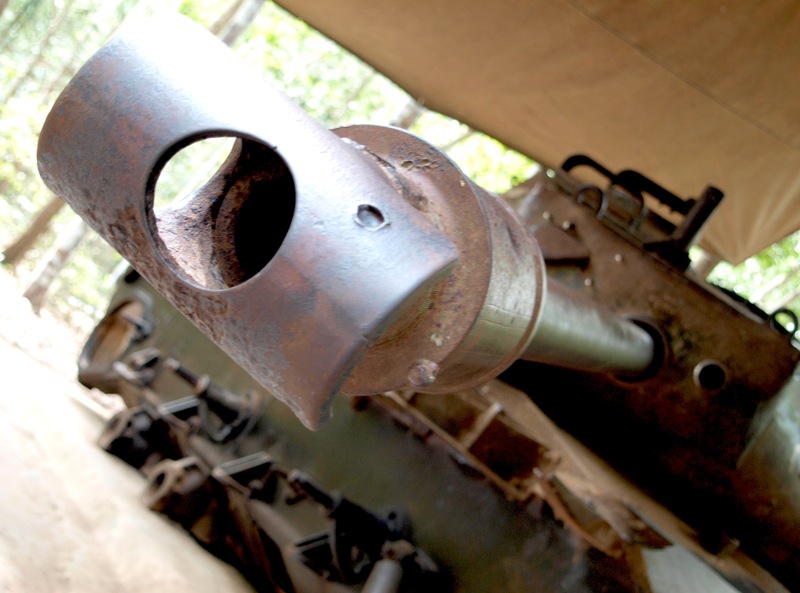 After many years of post-war dormancy, Cu Chi is back with a bang, its tunnel networks open to a host of well-fed international guests who think it might be fun to squeeze our fat western arses into a hole that was designed for a guerrilla army far smaller in stature than us. After a superterranean tour of the site where we got to see more war remnants such as part destroyed US tanks and still operational traps once designed to snare sniffer dogs, and in some cases, soldiers upon their lengthy spikes, we were offered the opportunity to let rip with a full arsenal of weaponry in the form of AK 47’s, M16’s, M1’s, M60’s, SKS’s and other sundry pieces of steel designed with an intent to kill. Of course, this communist country that fought long and hard against the evils of capitalism and profiteering would be charging us a premium for the service. After this it was on to the main event and a descent into the underworld created by the Viet Cong to frustrate and ultimately defeat their enemy. 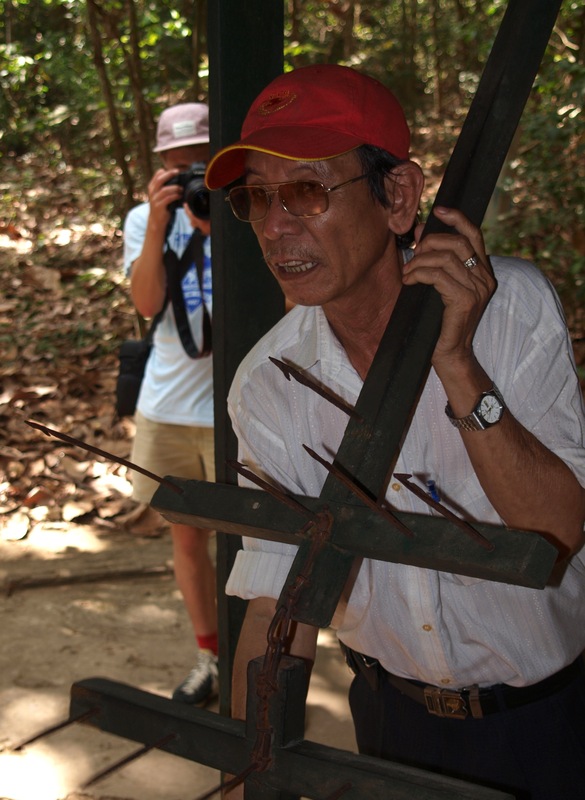 At this site, tunnels were dug with simple tools and bare hands, firstly during French control after WWII and with further expansion, during the Vietnam War. An extensive tunnel network was created which offered shelter, refuge and a defensive advantage over the American soldiers and their southern Allies. 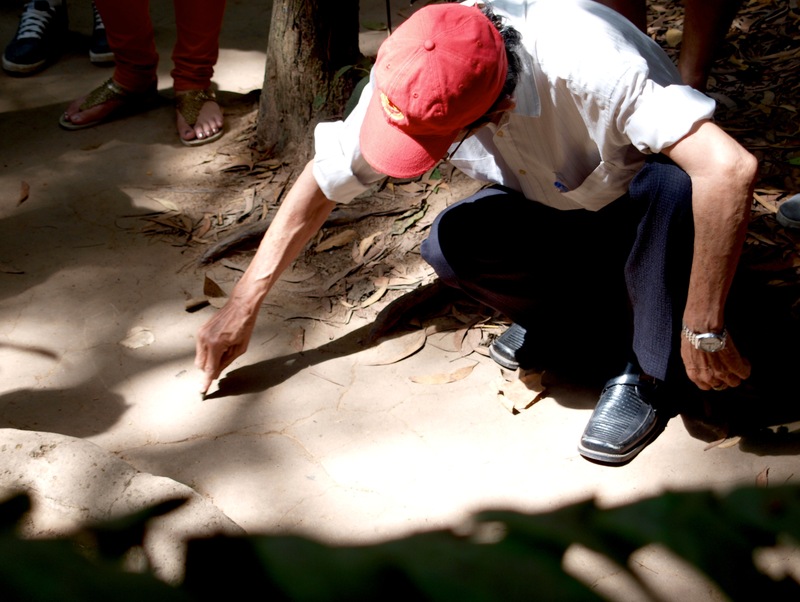 Despite carpet bombings and defoliation around US bases and in the town (a policy in clear violation of article 25 of the Hague Convention that has been 40 years in cover-up by the US Government), the Cu Chi guerrillas were able to continue their war from beneath the earth, emerging only to strike or to collect supplies under civilian guise. In these tunnels they slept, ate, planned attacks, and treated the wounded. As well as serving as ammunition caches, the immense tunnel network (which it is calculated stretched over 120 kilometres) served as supply and communication routes, linking local villages and assisting covert operations. Searching the tunnels was an extremely hazardous task as they were often rigged with booby trap devices. The unfortunate soldiers who were sent below ground to flush out the enemy (unkindly known by their comrades as “tunnel rats”) eventually exposed the extent of the network. 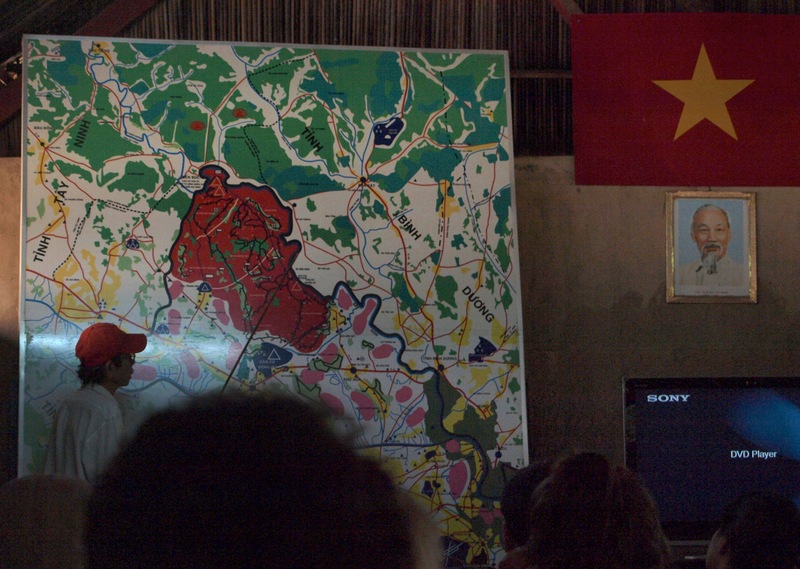 Though the tactics of the US and its allies improved, they were ultimately to be frustrated by the operations of this underground enemy a mere 40 kilometres away from the capital, Saigon. Our tour group leader and a friendly German lady (who sensibly chose to keep her lardy load from causing a serious Cu Chi blockage) offered to keep an eye on “The Boy” whilst we went below. 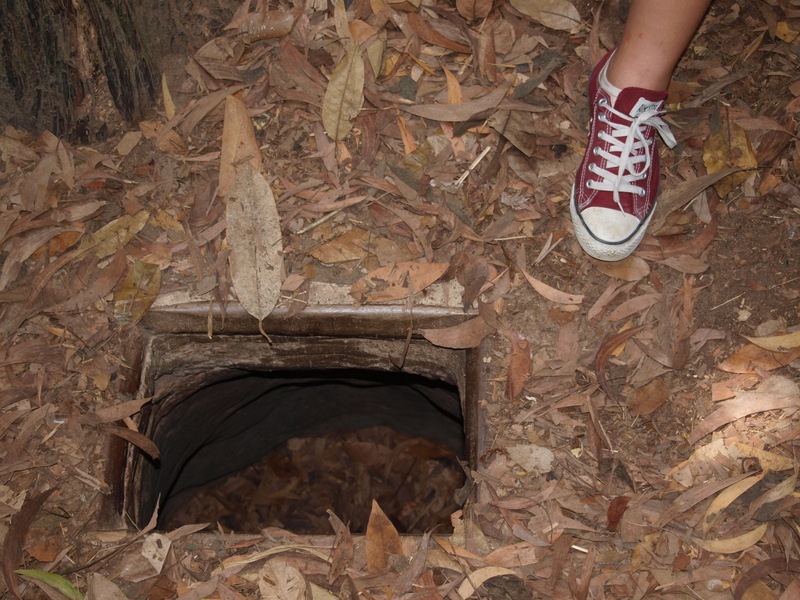 To descend into the tunnels is to get some perspective as to the harsh conditions the Cu Chi rebels lived in. Narrow, low and dark, the small section open to tourists (approximately 150m) gave plenty of chance to feel what it would be like to live as a mole. Finding the tunnels so low for my frame that it was difficult to squat and move forward without serious stress on my already battered knees, I opted to bail out half way along and let the 0.5 continue the journey on her own. The 0.5 emerged a minute or so after I had reached the exit, beaming broadly with pride in the knowledge that as the last one out today, she had been completing the “mop-up operation”. A good day out all round and something I doubt we’ll ever do again, but the most important thing for me that emerged from my visit was the questioning of whether the “illegal” actions of the US in Vietnam were the original catalyst of the decay in moral authority which so hamstrings their foreign policy to this very day? If none of our group can remember the conflict in Vietnam, then I can be sure we all recall the moral dilemma caused by the invasion of Iraq under what were then regarded as dubious, but by now almost universally (at least internationally) accepted as being false, assertions. A country that once held the moral high-ground and acted as a guardian of virtue has become a pariah to many people across the globe despite all that it has brought in terms of material wealth and cultural influence. The US may have lost the battle for Vietnam, but it eventually won the war against global communism. The victory came at great cost in terms of lives on either side. In terms of the moral authority of the US, it was little more than a Pyrrhic victory. 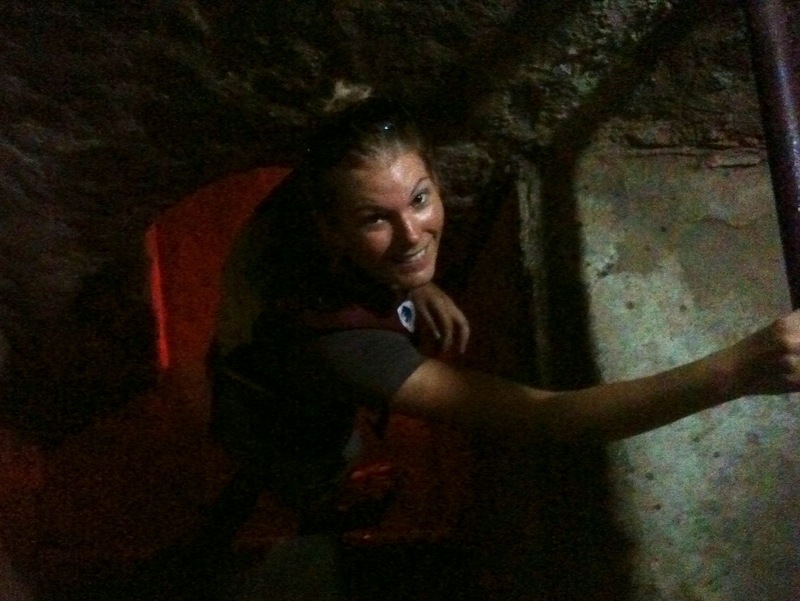 This entry was posted in Uncategorized and tagged Cu Chi Tunnels, Saigon, Tunnel Rat, Viet Cong, Vietnam War. Bookmark the permalink.